You can save time by learning when to use Icon, List, Column, or Cover Flow view. One program you use all the time is the Finder. It's your Mac's filing system, organizational structure, and overseer. We all know how to open, move, and copy files, but most of us go about our business without ever considering the most efficient way to get these tasks done. As a prime example, you can use the Finder's View menu options to view files and folders in four different ways, but most people don't know why they'd bother. They stick to one view for all their windows when, in fact, there are valid reasons to use each. Here's how to use the right view at the right time, and save time and trouble in the process. OS X uses Icon View by default. Select it by choosing View > As Icons, pressing Command-1, or clicking on the Icon View button in a Finder window's toolbar. This view shows your files as familiar icons. Some people like Icon View because they can arrange file icons as if they were objects on a desk. For example, one group of related items on the left side of a Finder window, and another on the right. Some people don't like Icon View for the same reason; icons can get messy and confusing. They're easy to straighten up, though. Choose View > Clean Up and the icons snap into a grid formation. You can not only place icons wherever you please, but also change how this view looks. From the View Options inspector (View > Show View Options or Command-J), you can, for example, adjust grid spacing (how close together icons appear) and choose a color or picture as a folder background. Another option lets you set, say, a green background for folders containing important files, and a blue background for folders containing documents you need to edit. Just press Command-J, click on Color (in the Background section near the bottom of the View Options window), and then click on the color well. When the color picker appears, choose your color and click OK. With different backgrounds, you can tell multiple windows apart at a glance. The options you set in the View Options inspector apply only to the selected folder, unless you select the Use As Defaults option; this applies the change to all folders that use the current view and that haven't already been customized in some way. (It will also apply to new Finder windows you open using File > New Finder Window or Command-N.) This can come in handy when a certain option proves useful for only certain types of files. For instance, choose the Show Icon Preview option to make the Finder display a thumbnail of files' contents (for file types it's familiar with). Since this is most useful for photos and videos—you can see their contents at a glance—you can turn previews on only for folders that contain them. Icon View lets you work with your files and folders much as if they were on an actual desktop. If things get messy (as they have here), choose View > Clean Up, and the icons snap to a grid. Likewise, you might use the Arrange By option in different ways depending on a folder's contents. 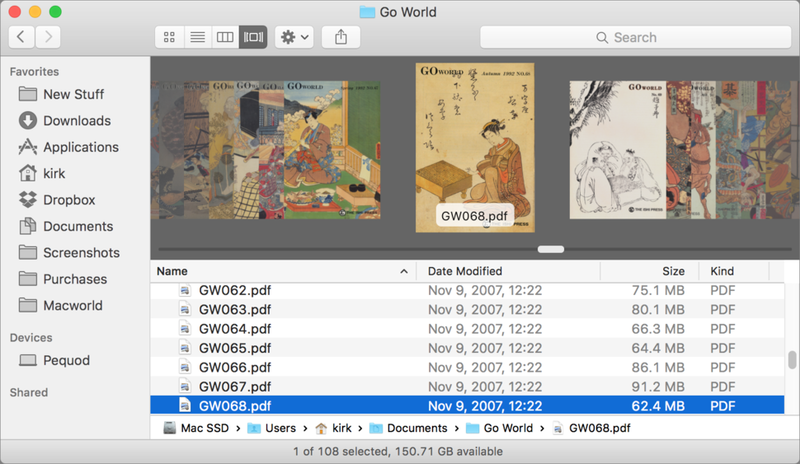 Open your Downloads folder, choose View Options, and then select Date Modified from the Arrange By menu to see the most recent files at the top left corner of the folder. In a folder containing files you want to copy to an external drive, you might choose Arrange By Size to see the largest files first, so you can choose which ones you can fit on the disk. If Icon View were the only choice for organizing files, many Mac users would be lost. Lots of people prefer the more compact List View (View > As List or Command-2). 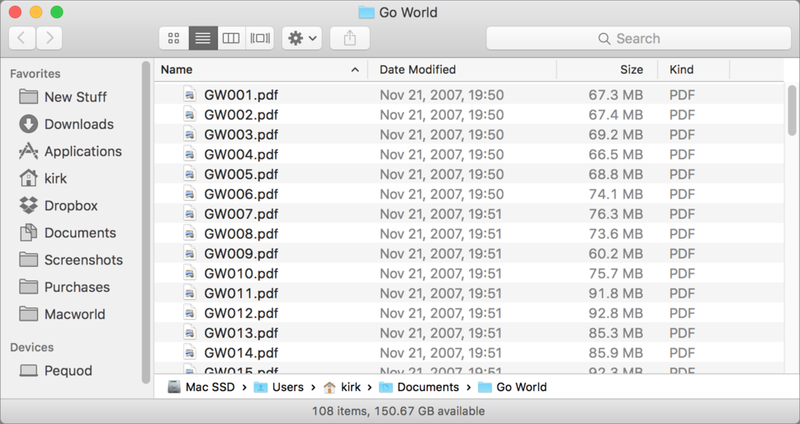 In this view, you see file names, dates (when the files were either modified or created), sizes, and more. The View Options inspector lets you choose which columns to display. Since List View is made up of columns, it's easy to change the order your files appear in. Just click on a column header to choose an attribute to sort by. For example, click on Date Modified to see the most recently changed files at the top of the list, and click on that header again to change the sort order and show the oldest files at the top. List View may not be very exciting to look at, but its columns can give you a lot of information about a file or folder at a glance. You can tell the files here are sorted by name, because the Name in the column header is slightly bold, and there's an arrow at the right of the column indicating the sort order. You'll probably find List View most practical for folders that contain lots of files you want to be able to sort by name, date, size, or kind. You have the option of displaying a preview icon as part of the list. List View has two icon sizes; small ones are tiny, and large ones are 24 pixels wide. Although they can provide an at-a-glance way to see what types of files you're dealing with, these icons aren't really big enough to be very helpful. If you use List View a lot, a better way to see file previews is to open a special Info window (Command-Option-I). Unlike the Info window that displays when you press Command-I, this window stays visible, changing its display whenever you click on a new file. You can see good-sized previews of your images here, as well as play music and movie files by clicking on previews. You can also open any file, folder, or application by double-clicking on this preview. One of List View's biggest advantages is that you can open folders and browse their contents in the same window. Click on the disclosure triangle next to a folder's name, and the folder's content appears below. You can open and close as many folders as you want, and go to as many sublevels as you want. To close a folder, just click on the disclosure triangle again. I know many people who swear by Column View. One Macworld colleague jokingly said to me, "You mean there are other views?" Column View (View > As Columns or Command-3) shows your files within their hierarchy; you see the folders and files above and below your current folder, each level in a separate column. This makes it easy to move files without having to open multiple Finder windows. Just drag a file from one spot to another in the hierarchy. So Column View is helpful, for example, when you need to zip up and down your Mac's hierarchy to find specific files and move or copy them to other locations. However, this view can get confusing, especially because when you click on a folder, the Finder may shift all of the window's columns to display its contents. You may have to scroll back and forth horizontally to keep track of things. You can arrange files according to name, date, size, and so on in Column View by choosing these options from the View Options window, but only the items' names are displayed. So Column View is not useful when you need more information than just names. However, you can choose to see a useful preview column, which shows a large thumbnail of the selected item. And here you can preview photos and videos along with all the file information List View provides, such as size, creation and modification dates, and more. Column View lets you see at a glance where your files are in your Finder hierarchy. Even though you can't view many details about groups of files, the preview column gives you a lot of information about individual files. Column View can be tricky. For example, it can be hard to figure out how to make new folders appear where you want. This is just a question of being in the proper column. Make sure you click on an item (not a folder) in a column before pressing Command-Shift-N to make a new folder in that column. If you click on a folder, the new folder will appear inside the selected folder. If you have trouble with files names getting cut off in columns, there a few quick ways to make them legible. Resize a single column by dragging the very bottom of one of the column dividers until you can see the longest file name. Alternatively, double-click on the divider to make it that size automatically. You can Option-double-click to make all columns as wide as the widest column in the Finder window, but this can make the window unmanageably huge. It's usually better to resize all the columns at the same time by pressing and holding the Option key while you drag. When you use Column View in an Open or Save dialog box, you have one more way to do this. Control-click on the column divider icon (at the bottom of the divider), and you'll see a contextual menu. Choose from Right Size This Column, Right Size All Columns Individually, or Right Size All Columns Equally. Cover Flow View gives you a different way to view your files. Choose View > As Cover Flow or press Command-4 to view your files and folders as graphics in the top section of a window; the same files are shown in a list in the window's bottom section. (You can't change that bottom section's appearance.) Cover Flow is not very useful for everyday file management because it limits the number of files you can see at a time. 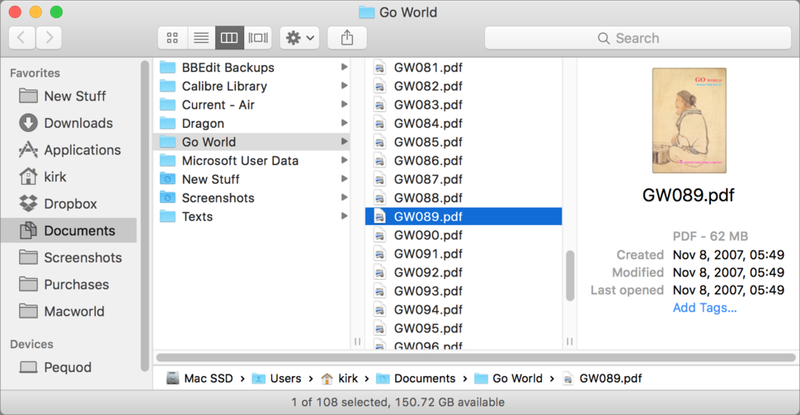 Cover Flow isn't practical for managing files and folders, but it can be useful when you need a quick way to look through a bunch of files that OS X can preview. All four views can display some kind of preview, but nothing compares with Quick Look. Use it in any view by selecting a file and pressing the spacebar. 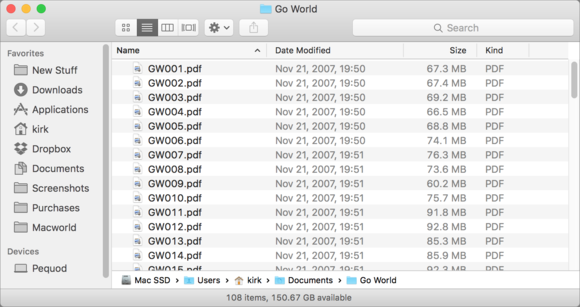 If the Finder can read the file type, a Quick Look window pops open and displays the file's contents. You don't have to wait for an app to load or the file to open, which means that you save a lot of time when you just want to glance at some files to find the one you're looking for. Quick Look can be more or less interactive for different types of files. For Apple Numbers and Microsoft Excel workbooks, you can click on worksheets to see their contents. You can scroll through Microsoft Word documents and Apple Keynote presentations, and you can click on links in HTML pages. Have a folder full of files you want to examine closely but quickly? Select the files and then press the spacebar. You'll see a number of tools displayed on the Quick Look window. 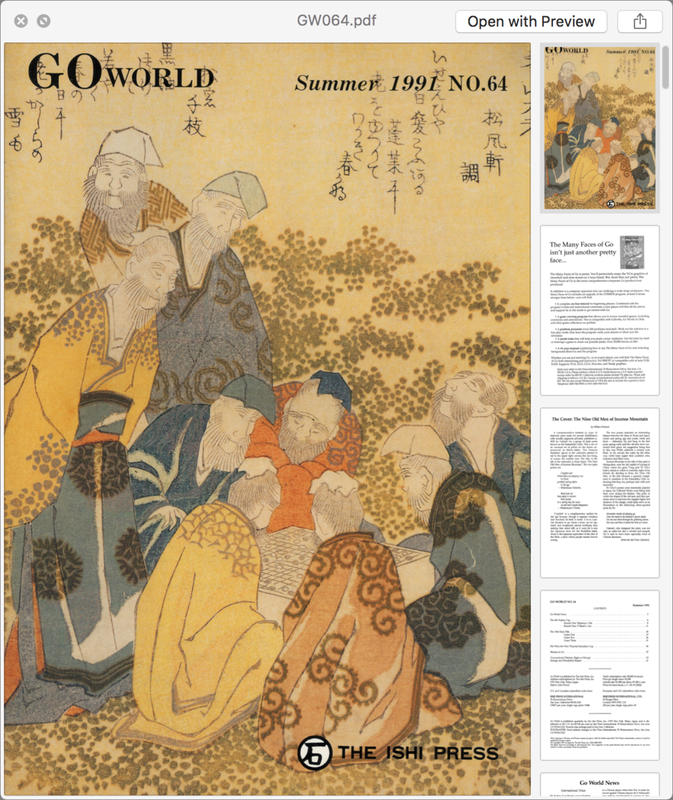 With some files, such as PDFs, Word files, Pages files, etc., you'll be able to view thumbnails of the files' pages. If you've selected multiple files, click on the Previous and Next arrows to move through your files. Click on the Index Sheet button to see all the files' previews at once, or click the Full Screen double-arrow button to make the preview fill your screen. If you decide that you want to preview a different file, don't close the Quick Look window; rather, just click on a different file. The Quick Look window will update to show the selected item. And click the Open With button at the top of the window to open the file with its default app. There's also a share button at the top right that lets you send it to a friend by email or Messages, share it on Facebook or Twitter, and more. The Quick Look window lets you see into your files, and, for some document types, scroll through thumbnails of their pages. One disadvantage of Quick Look is that its floating window appears only when you're in the Finder. If you switch to another program, it disappears. It doesn't close, though; just switch back to the Finder to see it again. Press the spacebar to dismiss it. You spend a lot of time in the Finder, so learning about its many possibilities can save you time and give you more power over your files and folders. Mastering Finder views is one of the first steps to becoming a Mac power user.